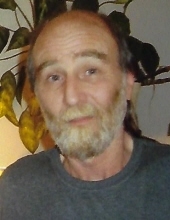 RITZERT, Steven Jay - age 59, of Flint, died Thursday, October 18, 2018. A memorial service will be held at a later date. Those desiring may make memorial contributions to the Alzheimer's Association or the American Heart Association. Steven was born June 17, 1959 in Flint, the son of Paul J. and Donna (Wilder) Ritzert. He had worked at the GM Proving Grounds in Milford and was the office manager at his brother's business Carriage Town Truck and Auto. Surviving are: mother, Donna (Joseph) Mihailoff; siblings, LeeAnn Ritzert, Michael (Cheryl) Ritzert, Michael (Meredith) Mihailoff, and Elizabeth Mihailoff; sister-in-law, Courtney Robins; many nieces and nephews; mother of his children, Roseanna King. He was preceded in death by: his father, Paul Ritzert; and two children, Nicholas Ritzert and Amber Slack. Tributes may be shared at www.sharpfuneralhomes.com. To send flowers or a remembrance gift to the family of Steven Jay Ritzert, please visit our Tribute Store. "Email Address" would like to share the life celebration of Steven Jay Ritzert. Click on the "link" to go to share a favorite memory or leave a condolence message for the family.